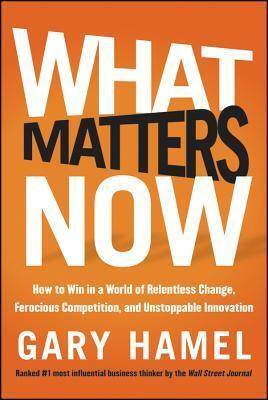 Gary Hamel is one of the most influential business thinkers nowadays. He has lot of things to tell in his latest book What matters now. It's a book about innovation, management innovation and how to make a world a better place. So it's a book about many thoughts, that come together in Gary's mind. I finished the book about a week ago and I'm still bit puzzled, what it was all about. There was so many good things presented there and so many good examples around the world, that it takes time to digest it. Maybe the main message there is, that management practices in use are old and these don't help to get the full potential out of the people in companies. Gary Hamel has found really interesting examples from very different kind of organizations all around the world to demonstrate how management and organizational behaviour can change. There are organizations from churches to small and huge companies in very different industries presented. The main similarity between examples is, that there has been in these organizations few people who have wanted to make a change in how their organization operate. The book was really interesting and inspiring. It raised a lot of questions and gave some answers. It brought lot of seeds for ideas, but left also many questions to wonder. It was easy to read, but hard to digest. I really like the way Gary Hamel writes. It's always interesting and easy to read, whatever the subject is. I recommend it for everyone interested in organizational improvement and new management practices. It's an important book which raises questions and thoughts. It's a pleasure to read. I've come to a conclusion, that when an IT investment needs a business case to prove its existence or purchase, then it is not worth of it. When IT investment is good enough, everyone will know its benefits and it will help the company to operate better than previously. When main arguments for acquiring a software is that it will save money from somewhere, its not really worth of investement. I'm not saying money doesn't matter. Of course there needs to be considerations how much IT or SW investments costs, but that shouldn't ever be the driving force for any investment. If it is, company getting the SW or IT might be in trouble soon. Great companies have the best tools for their internal development and processes. They never settle for the most cost effective ones. They search for the best ones out there. Sometimes those are the cheapest ones, sometimes more expensive ones. Sometimes those are out of the box, sometimes tailored for the company and sometimes company has to create those themselves. The important factor is the value those bring to the company, not the price tag. One morning several months ago I got an idea to create a cartoon of our product at work. The idea came when I started to think what would be the simplest possible form to explain what our new product actually does. I drafted a version of this cartoon to a paper shortly and went off to introduce it to my colleagues. I was happy to notice they were excited about the idea and we started to improvise even more what the cartoon could be like. Next challenge was to find someone to draw it. That turned out to be much simpler task that I anticipated. I just googled for finnish cartoons and found one, that had done in a style we wanted. Then we mailed to her and she promised to make it. After specifying the cartoon in more detail, we explained it to the artist to draw it. She understood us easily and well and we got beautiful cartoon in couple of weeks. . I'm quite proud what we as a small team were able to pull out. 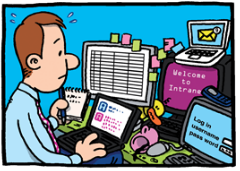 Check out the full cartoon from our company website to judge yourself: Asset Browser Cartoon. This is part of the productizing process of our new product. Based on feedback what we have received this was definitely a good exercise. This was a lesson that even with limited resources it is possible to do really many things on supporting the productization of a new product. It didn't actually cost us much in money or in time compared to so many other things in marketing. I urge everyone to be more playful and fun even in business to business marketing. Nowadays it is mainly just plain boring. It doesn't have to be.